Psalter Quiz #1 – Which Psalter is it from? This entry was posted in Which Psalter? and tagged Exclusive Psalmody, psalter image. Bookmark the permalink. 1) In what language is it written? 2) Can you tell by examining the picture how old it might be? 3) What is the subject of the song? Judging from the appearance of this version of the Veni Creator Spiritus in pdf files of the Book of Common Prayer, my guess is that it comes from Tate and Brady’s so-called New Version Psalter. Great guess, but a few years too late. The image above is from 1565 and published in London. The Brady-Tate was first published in 1696 in Philadelphia I believe. They may have the same version of the Veni Creator, however, I am not sure. Would it be Sternhold & Hopkins then? It has to be Sternhold & Hopkins. I have a pdf copy of the entire psalter, and it includes this metrical versification of the Veni Creator Spiritus at the end. By the way, doesn’t the inclusion of this hymn stand in tension with your emphasis on exclusive psalmody? Virtually all of the early Reformation-era psalters included the Lukan canticles, the Decalogue, and such early hymns as the Te Deum and Veni Creator Spiritus. Yes, it is from the Sternhold Hopkins Psalter of 1565. Great job identifying it for us! Yes, the inclusion of uninspired hymnody in many important historic Psalters is in tension with the theology behind EP. I included it at the beginning of the “Which Psalter is it?” series to spark discussion of this problem. In my own view the inclusion of these hymns helped lead to the disparity in worship that we find in our own day. Many of our brethren, including Calvin, were making great strides forward in versifying and singing the Psalms in worship. I would contend that they didn’t go quite far enough in their reforms. In short, the EP position is the next step that should have been taken. We could argue that Calvin was very close to the position that we EPers desire. Many of our treasured Psalters have hymns such as the Veni Creator included for the edification of the reader/singer. I think it more accurate to say that these inclusions have not been for the good of the church. “Thomas Sternhold published his first, short collection of nineteen Certayn Psalmes between mid-1547 and early 1549. In December of 1549, his posthumous Al such psalmes of Dauid as Thomas Sternehold … didde in his life time draw into English Metre was printed, containing thirty-seven psalms by Sternhold and, in a separate section at the end, seven psalms by John Hopkins. This collection was taken to the Continent with Protestant exiles during the reign of Mary Tudor, and editors in Geneva both revised the original texts and gradually added more over several editions. 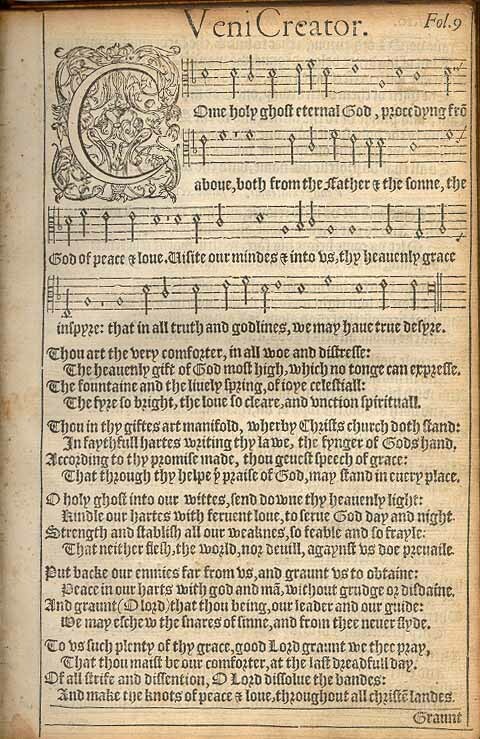 In 1562, the publisher John Day brought together most of the psalm versions from the Genevan editions and many new psalms by John Hopkins, Thomas Norton, and John Markant to make up The Whole Booke of Psalmes, Collected into English Meter . In addition to metrical versions of all 150 psalms, the volume included versified versions of the Apostles’ Creed, the Magnificat, and other biblical passages or Christian texts, as well as several non-scriptural versified prayers and a long section of prose prayers largely drawn from the English Forme of Prayers used in Geneva. In 1621, Thomas Ravenscroft published an expanded edition of the Sternhold and Hopkins Psalter; Ravenscroft’s edition added many more psalm tunes, some of which were composed since the first publication by leading late Tudor and early Stuart English composers such as Thomas Morley, Thomas Tallis, John Dowland, and Thomas Tomkins. Another musical contributor to this volume was John Milton, senior, the father of the poet. By any objective measure of circulation, Sternhold and Hopkins’s psalter were a success. As a separate volume, they were re-printed more than 200 times between 1550 and 1640; in addition, they were included in most editions of the Geneva Bible, and also most versions of the Book of Common Prayer. They continued to be in regular use in some congregations until the late eighteenth century.